Walking from Valletta to Sliema along the coast and continuing to St Juliens. This is probably my favourite urban walk and one Anne and I have done a number of times. The walk starts from the bus terminal just outside of Valletta. As we have done this walk mostly late mornings or early afternoons we have often purchase a few cakes etc to eat on our way. These have usually been obtained from one of the stalls in the bus terminal. From the bus terminal you walk away from the city through the linear Maglio Gardens, located between two roads, the Mall and Triq Sarria (triq is Maltese for street or road). There are usually some vacant seats in this area so if the sun's shining, which it usually is, it's a good spot to eat the cakes. Freesias growing over the ramparts. 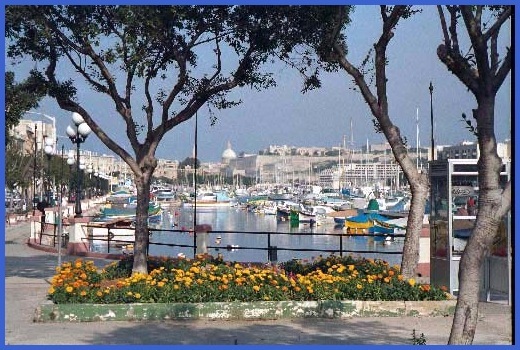 At the end of these gardens the rout e goes right, and on reaching a T-junction the way is left down a steep hill (Triq Maison), which leads to the Valletta terminal for the Gozo Ferry. However, before reaching the terminal there are some gardens on the right and it is well worth taking a detour here to look at the plants and the views. 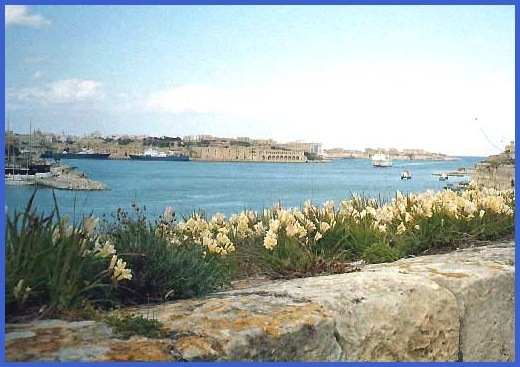 From the walls of the garden, which are more akin to ramparts, it is possible to see across the water to Manoel Island, locate to the south of Sliema. In March we have always found Freesias growing wild on these ramparts. Anne loves the sight of these. 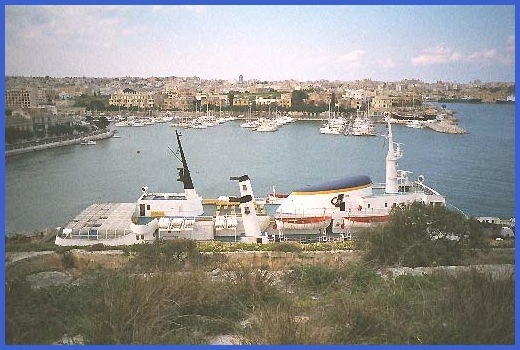 Looking down on the Gozo Ferry from the freesia wall. Having passed the Ferry Terminal, unless we want to take short cuts, which will take us inland, we follow the coast all the way back to Sliema. Another view of the marina at Ta'xbiex. 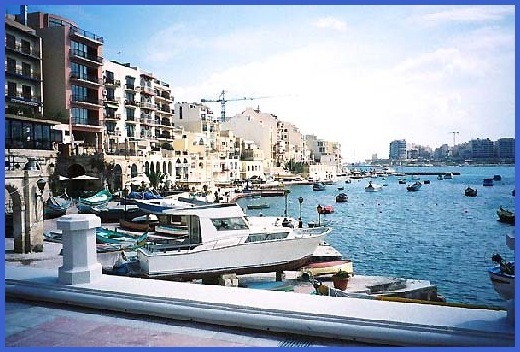 So we walk along Triq Tal Pietra and very soon the road bends left and we are on Msida Sea Front and the yacht marina, with many expensive looking boats. In fact from now on until we reach Manoel Island (which is actually joined to the main land by a bridge) we will pass a number of marinas. The next one is on Ta'xbiex sea front and, having rounded the promontory that this suburb is located on, we reach a further marina with an adjacent recreation area. By now it's usually time for an ice cream, and this is a very pleasant location to enjoy one. From here we pass Manoel Island - if your interested in football there is usually a match taking place here on a Sunday Morning - and soon after we are on the sea front in Sliema. 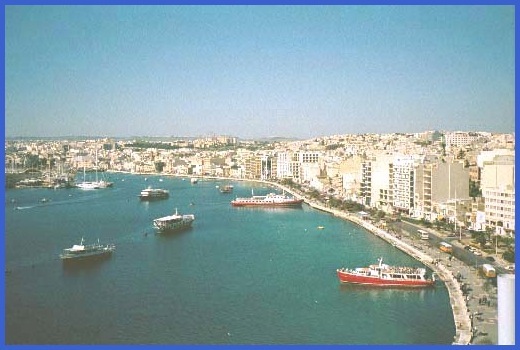 Sliema - Manoel Island is to the left and Tower Road is to the right. If a longer walk is desired, rather than continue all the way along the coast it's best to turn left near the ferry terminal and go up Tower Road to reach the other side of the Sliema Peninsula. From here follow the coast left and in an hour or so you will be in St Juliens Bay. The harbour at St. Julien's Bay. Complete with couple of cranes in the background. This photo was taken in 2000 so the building work may be completed by now! 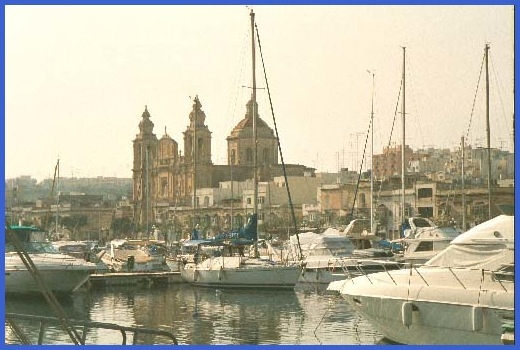 Distances - it's just under 5 miles from Valletta to Sliema and further 2 miles from Sliema to St Juliens Bay.